1880s autograph album that was presented to Minnie M. Penrod by her friends at Edinboro, Pennsylvania, as she prepared to move to California. The album is approximately 8" x 5" with puffy velour covers and contains 105 pages of the sentiments of Minnie's relatives, classmates and friends. An alphabetical list of the signers appears at the end of this post. Minnie M. Penrod was born 1 May 1867 at Edinboro, Pennsylvania, the daughter of Eli Abraham Penrod and Martha Ann (Proud) Penrod, who were born at Chippewa, Canada, and Edinboro, Pennsylvania, respectively. Minnie's paternal grandparents were William and Laura (Taylor) Penrod, who emigrated from Great Britain to Canada. Her maternal grandparents were William and Laura (Davis) Proud, who were born in England and Pennsylvania, respectively. A couple of the signers indicated they were students at N.W.S.N.S., which I think stood for Northwest State Normal School, located at Edinboro. Minnie may have been a student there as well. At some point in late 1886 or in 1887, Minnie and her family relocated to Petaluma, California. I'd be interested in knowing what motivated them to move west. About 1896, Minnie married Ira Burnside Raymond, son of Edgar and Sarah A. (Smith) Raymond, who were both Iowa natives. Ira was born 30 May 1867 in Iowa. The couple raised at least two children, daughters Ethel and Edith, at Petaluma, where they operated a dry goods store. I found a montage of photographs of Minnie, Ira and their daughters here. Minnie died in 1934, and Ira in 1943. Two signers in the album indicated they were Minnie's cousins. They were sisters Cynthia (Beam) Richardson and Georgie (Beam) Dunn of Ontario, Canada. Their mother was Mary Ann Taylor, who may have been a sister or other relative of Minnie's paternal grandmother Laura (Taylor) Penrod. Cynthia Richardson of Port Colborne, Ontario signed her page in August 1886. 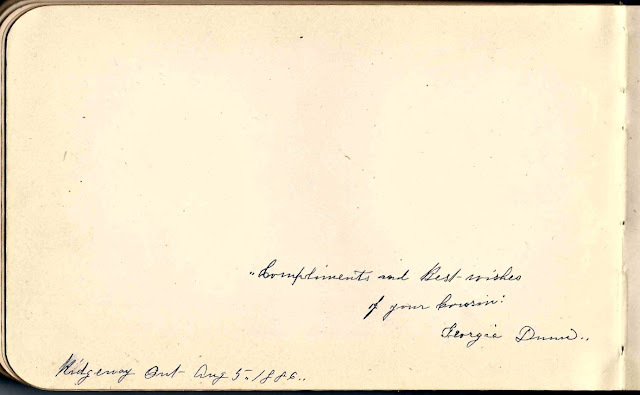 Georgie Dunn of Ridgeway, Ontario, signed her page on 5 August 1886. 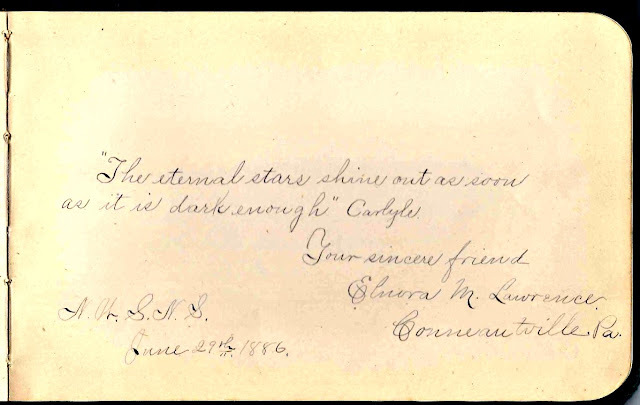 Elnora Lawrence of Conneautville, Pennsylvania signed a page on 29 June 1886 at N.W.S.N.S., which was Northwest State Normal School, located at Edinboro, Pennsylvania. Clara, signed at Edinboro, Pennsylvania on 25 July 1886. She may have signed her surname in another area but it's very hard to read. U. S. Bacon of Edinboro, Pennsylvania, signed there on 3 August 1886. Love his saying: In times of Prosperity our friends are many, But the times of adversity Proves them." 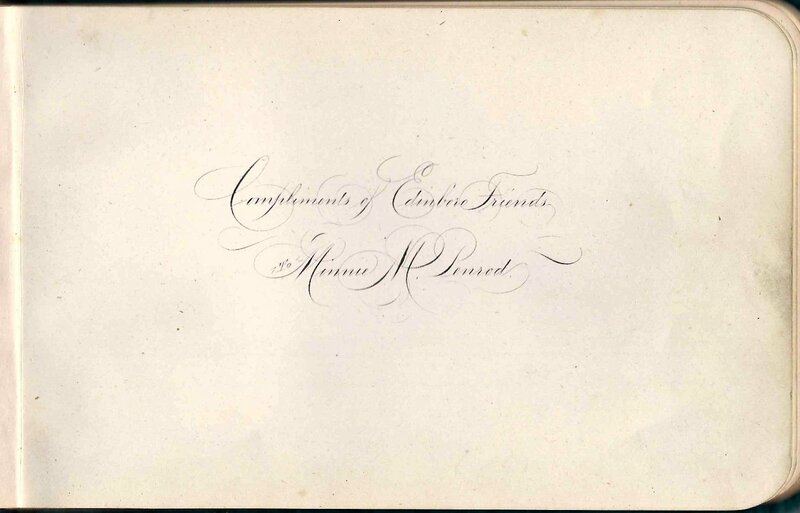 Eugenia Deamer of Edinboro, Pennsylvania, signed "8-10-86"
Georgia Dunn, signed at Ridgeway, Ontario, on 5 August 1886; Minnie's cousin. She may have been related through Minnie's father Eli Abraham Penrod, who was born in Canada. Initials hard to decipher, but possibly M. S. Gillaspie of Edinboro, Pennsylvania, signed on 9 August 1886. Name looks more like Gillaspie. Interestingly, there was a Martin S. Gillespie of Edinboro. Peter R. Kelley of Edinboro, Pennsylvania, signed on 8 August 1886. 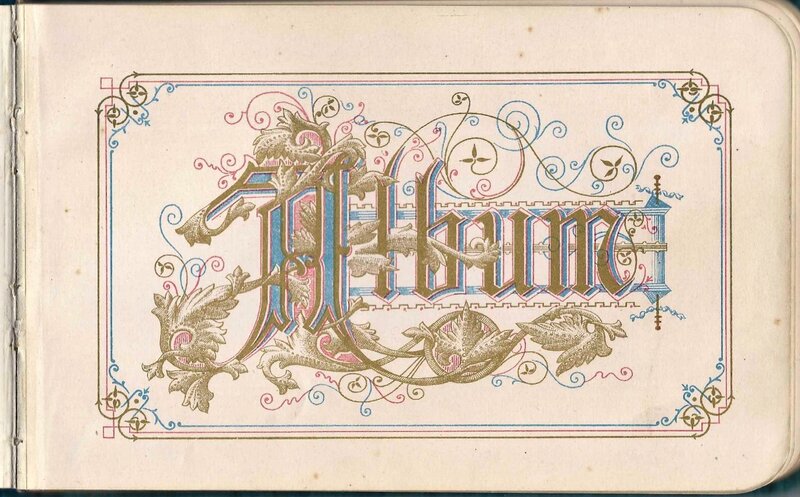 He or a relative of the same name signed another page, shared with his wife. The handwriting is very similar. Myrna C. Langley of Edinboro, Pennsylvania, signed 31 July 1886, mentions Y.W.C.T.U. G. A. Langley: "May the golden gate of California be the Golden Gate to your life, is the sincere wish of your friend"
R. Guy McClancy, signed at Edinboro, Pennsylvania, on 1886-8-10. Not sure if I've deciphered the name correctly. 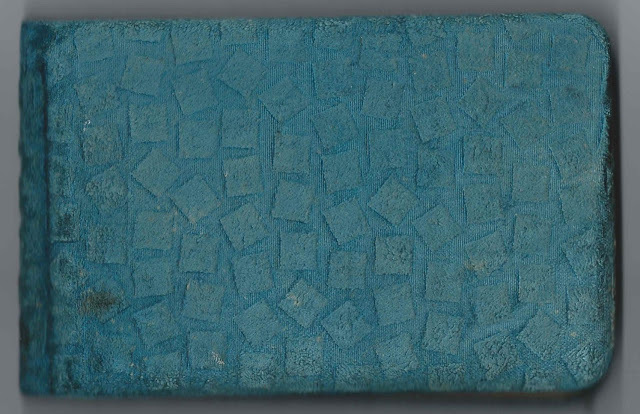 Mrs. P. M. McClymonds, signed at Edinboro, Pennsylvania, on 7 August 1886. Not sure of first initial. W. A. Proud of Edinboro, Pennsylvania, signed "8-10-1886". Likely a maternal relative of Minnie. Mrs. C. T. Reeder. She inscribed her page to Lillie. Either Mrs. Reeder meant to inscribe her sentiments to Minnie's younger sister Lillian, or she confused the two. Allie Reeder, signed at Edinboro, Pennsylvania, on 22 July 1886. 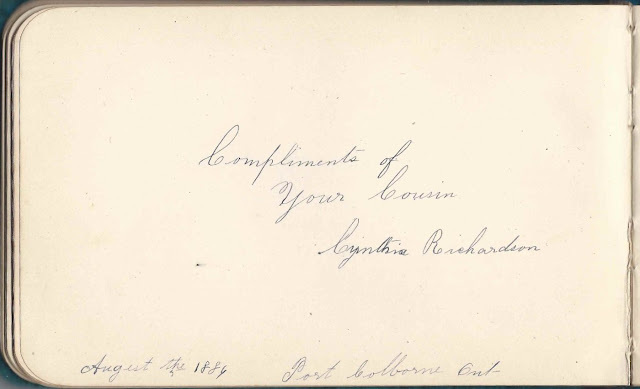 "Your neighbor"
Cynthia Richardson, signed at Port Colborne, Ontario, in August 1886. She called herself Minnie's cousin. Cynthia (Beam) Richardson's mother was Mary Ann Taylor, born in England about 1823. Minnie's paternal grandmother was Laura Taylor, also born in England and an immigrant to Canada. The two could have been sisters or otherwise related. Harry Taylor, signed at Edinboro, Pennsylvania, on "7-1-86"
Minnie Underwood, signed at Edinboro, Pennsylvania, on 22 July 1886. "Your Chum & Twin"
Mrs. J. T. Wade. Inscribed a poem by Charlotte Cossit.